So… I’m still sifting through those 20+ thousand never seen by anyone (including me) photos buried in my computer. Last night I found these, processed them through Lightroom, and although they are interesting in colour, black and white just seems to transform them into something purely magical. The photos were taken during my trip to Italy in 2010 where three of my works were featured at an international exhibition. My return flight was out of Rome, so I had time to “roam” around the city a bit. What I didn’t realize at the time was that, being Sunday in the home of the Roman Catholic Church, stores were CLOSED (my plan had been to buy a pair of Italian boots and then go sightseeing). So… I ventured out and eventually found myself walking up the busy via Labicana hoping that something somewhere might be open. Suddenly I noticed the Colosseum up ahead in the distance. It was so unexpected, such a powerful OMIGAWD moment–how could such an ancient landmark possibly be situated on a bustling urban street?! I practically ran the rest of the way in my excitement, relieved to be scratching off one of the big items on my Rome To-do List so soon. And even better, by pure chance admission was free to all museums and heritage sites that weekend, so I got to hang out at the Colosseum until closing time and sunset. It was so relaxed, not terribly crowded, and truly amazing! Here are a few of the full colour shots. Enjoy! 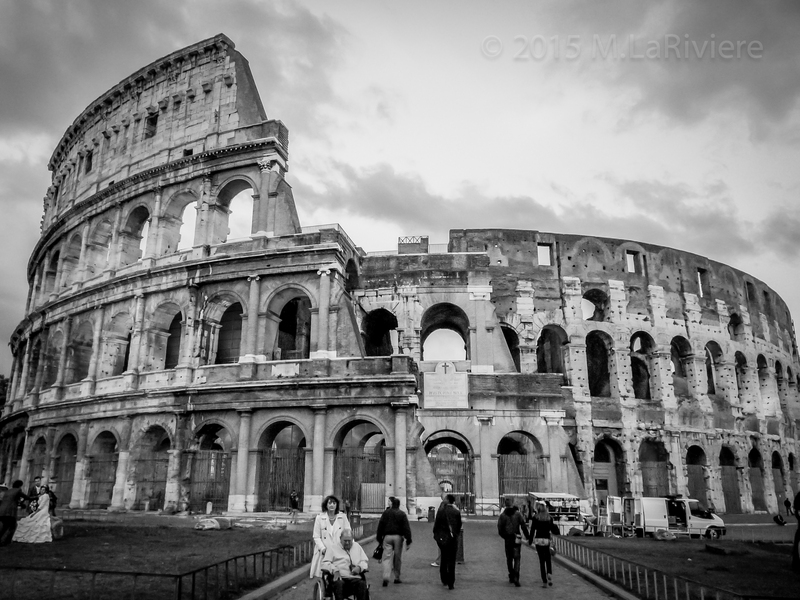 This entry was posted in Anecdotes, Personal, Photography, Writing and tagged Black and White Photography, Colosseum, Gladiators, Photography, Rome, travel. Bookmark the permalink. Thank you Ana Lucia! It’s fun revisiting that amazing day! Thank you… as are yours! Loved the ones of Montsalvat! Great photos Michelle! I love digging through old and long forgotten work only to discover the treasures that were hidden. Thank you, Thomas. It’s a fine balance between mining/purging the old files while continually adding newer and better work to the library. My goal is to continue sifting, and keep only the best (perhaps with light sprinkling of sentimental retained for good measure). Thanks again! You’re welcome, and I know that process all to well.